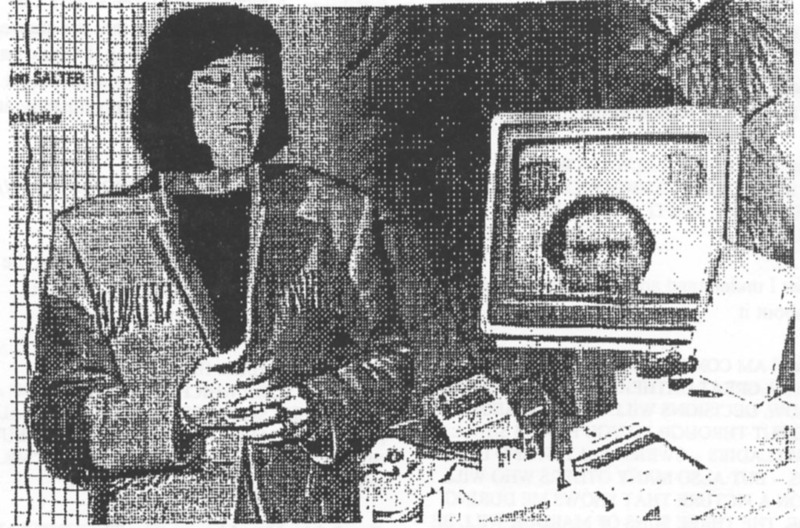 A third picture, received in Luxembourg as a computer file, shows the picture of Juergenson on a terminal in the Timestream lab, as Swejen Salter prepares to send it to the TV set of Adolf Homes on Earth. 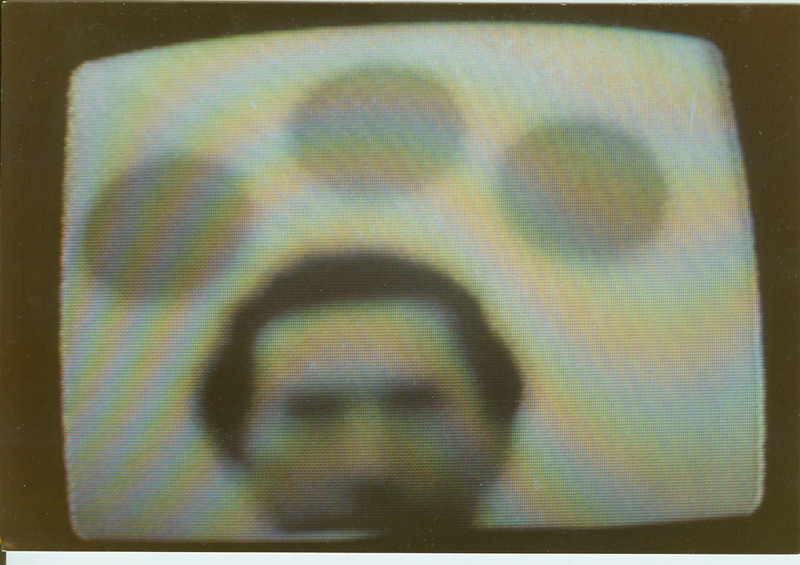 Swejen Salter in the Timestream spirit lab prepares to send the Juergenson picture to Adolf Homes' TV. 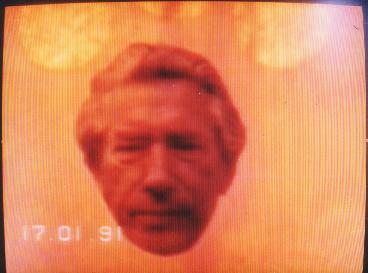 This picture of Swejen was received through a computer of Maggy Fischbach in Luxembourg. I just thought of a question. Before Eden blew up and became the spiritual place Marduk, Where would spirits who died on earth go? Since Eden was still a physical place. Good question, George. I’ve wondered about that myself. First of all, physical Eden and astral Eden used to coexist, like two superimposed worlds in different dimensions. (Just as the physical Earth is superimposed by an astral “shadow world” of the Earth.) When physical Eden exploded, astral Eden remained. That said, best I can figure, the Edenites didn’t need an afterlife in the way that we think of an afterlife. In any case, the Edenites probably didn’t have to contend with that dichotomy (physical life vs spiritual life) the way we do. I suspect their lives were more integrated between what we call the physical and the spiritual. They could probably coexist in two or more dimensions at the same time and retain some awareness of those other concurrent lives of theirs. While we just get glimpses of our current astral experiences in dreams, they would probably be both dreaming and awake, experiencing both their physical and their astral lives in real-time, and somehow being able to reconcile the two different lives. The astral lifetime and the physical lifetime of the Edenites probably weren’t as vastly different as ours are. I suspect that astral Eden was a template used to create the physical Eden (Marduk), and many of the activities in the two worlds went on in parallel to a large degree. There was no gender, and life did not have to kill life to survive. Neither on astral Eden nor on physical Eden. Both worlds were what we would call paradise. After Eden blew up, things were a mess for a while. The physical universe was filled with meteoroids that pummeled the other planets. The astral universe was suddenly filled with terror, grief, and remorse among the astral Edenites whose lives were thrown into chaos… and a new kind of physical life and afterlife evolved from the chaos. To your original question, which I almost forgot… how about the Edenite colonists living on Earth before the explosion? They were probably more closely associated with the astral Eden than with the astral Earth… so their physical lives (wake time on Earth) and astral lives (dream time on Eden) were more alien from each other. After the explosion, with all the chaos, that’s probably when “The Project” started. The brilliant astral Edenites living now on the ASTRAL Eden were working with the terrified and confused physical Edenite colonists marooned on Earth, trying to restore some semblance of order…. Thanks for casting light on the matter, George. I think I’ll finish this as a blog article in the next week or two. Very important information, and I think I’m starting to see how it falls into place…. Thank you!